Take care of your body, improve your posture: Introduction » MASSAGE by NochesSinLuna » Massage Therapy Clinic- Sturgeon Falls, On. Take care of your body, improve your posture: Introduction. By Luis Gerardo Galvan Reyes, RMT. Everyday we surround ourselves with all kinds of machines and function oriented objects, and for the most part of it we take good care of them: regular service for your car, checking out the pockets of your pants before tossing them in the laundry machine, covering up your food while nuking it in the microwave, keeping the fridge’s door closed, etcetera. And that makes sense, because we know that if we misuse these things they’ll break, and it’ll cost time and money to fix or replace them. Now imagine you have a machine that works for you 24 hours a day, that takes you anywhere you want to go, performs any task you ask it to do, and also connects you with all kinds of sensations and enjoyable experiences. One little trick, you only have one, and if it breaks you cannot replace it. Wouldn’t it make sense to take care of this machine as much as, or even more than, the ones that are replaceable? This is the case of our body, we use it every day, and some of us don’t even stop for a second to consider everything it does for us, never mind thinking about how to keep it functioning at its peak condition. One very easy way to start caring about our body is improving our posture, which will translate in healthier muscles and joints, more efficient respiration and circulation, and even improved state of mind and animosity. Side by side comparison: good vs. bad posture. Illustration by lggrCorp. As a Massage Therapist, I observe postural imbalances and deformities on a daily basis in most of my clients. In many cases, these factors are one of the primary causes of their complaints. 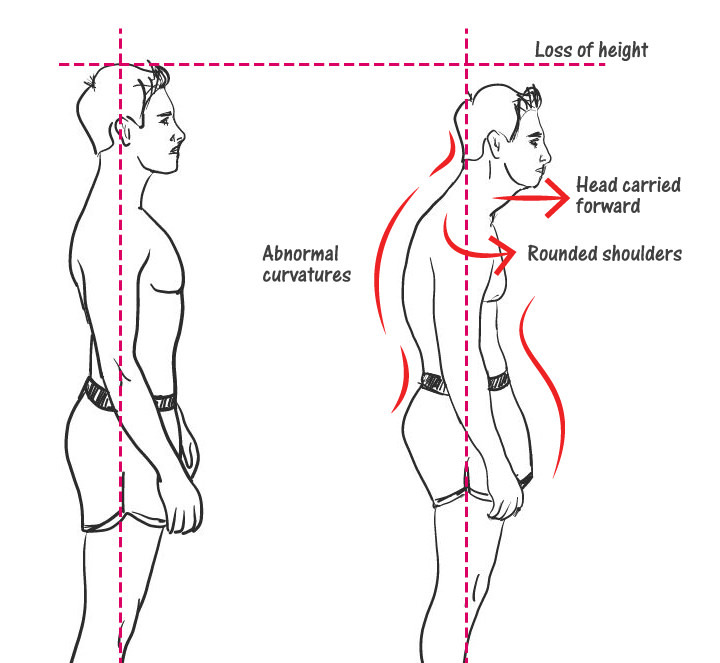 Rounded shoulders and head carried forward (slouching), unleveled shoulders, hiked hips, curved spines, bent feet, misalignments, and many other faults are present in most of us, and we should actively observe them in order to make a conscious effort for fix them, after a little while, a good posture will become natural. Pro-actively working to fix our posture falls into the definition of “preventive health care”, since it’ll help to maintain muscles and joint health, and prevent disorders associated to sedentarism and postural imbalances. Part 1. Introduction (Published: March 6th, 2017). Part 2. Stand and walk properly (Not available yet). Part 3. Seat better (Not available yet). Part 4. Work smarter (Not available yet). Part 5. Sleep correctly (Not available yet). I hope you learned a little bit after reading this piece, and that my writing was clear enough to make it easy to read. If you ended up with more questions than answers, please feel free to ask away, email me to office@nochessinluna.com putting "ARTICLE 2017-0306: Question" as subject, or "ARTICLE 2017-0306: Feedback" if you just want to make a comment or point out errors in the presented information. If you want me to write about a topic in particular please request it with the subject "ARTICLE Topic: Suggestion". (1) )WERNER, Ruth. “A MASSAGE THERAPIST’S GUIDE TO PATHOLOGY”, 5th Edition (USA, Lippincott Williams & Wilkins, 2013): Kindle edition, locations 2585-2587/30390. ( ) Muscolino, Joseph E. “Kinesiology: The Skeletal System and Muscle Function”, 2nd Edition (USA, Elsevier-Mosby, 2011): 603. Whoa! looks like this is the newest post. Come back next week for new content. Article » Fibromyalgia Syndrome: Understanding and Managing the Condition.